As far as we know this is the first atomizer developed by high-end chip (and device) maker Yihi, and it’s certainly an eye catcher! The Yihi SXMini Faucon RDTA features a curving robotic-like design and houses a 24k gold-plated two post, shelf-style deck for single coil, flavor orientated builds. It accepts up to 3mm coil leads and the large wicking ports allow horizontal coils to be wicked organically. 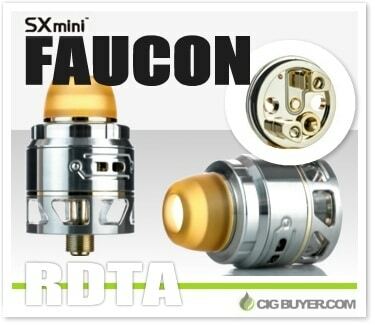 The 24mm Faucon RDTA Tank has dual adjustable air slots on each side, with a 2mm side-mounted fill hole for use with up to 2ml of e-liquid. It comes with two 810 drips tips – derlin and ULTEM.